Orthodox Church liturgical Oblation table vestments (black-gold) by Istok Church Supplies Corp.
Don’t miss out on a wonderful opportunity to purchase a high quality, made-to-order black and gold Oblation Table vestment for a very reasonable price. The collection on this page includes Oblation Table vestments made from eye-catching church fabrics such as silk and brocade. The Oblation Table occupies an important place at the sacred Holy Altar of an Orthodox Christian church. It is the place where the Liturgy of Preparation takes place and hence has everyone’s eyes on it. We offer magnificent black-gold Oblation Table vestments that are not only incredibly attractive but also fulfill the vestment requirements for the Holy Altar. They are ideal for use during the Lent period when the mood is somber. 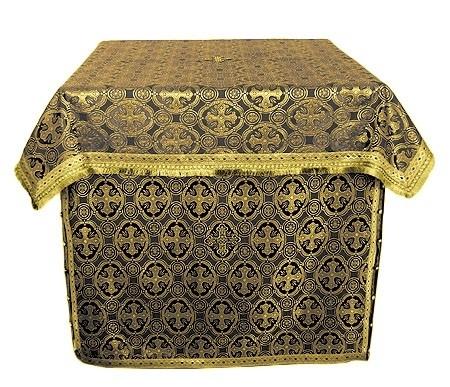 We offer black-gold Oblation Table vestments in luxurious church fabrics such as silk and brocade. Vestments made from man-made silk are more economical than vestments made from brocade material. Based on quality and detail, each fabric is assigned a category and customers have the option to purchase a particular vestment in a different fabric belonging to the same class. The entire selection of materials can be viewed in the Fabrics section of our website and after selecting an alternative, customers can make their request in the Notes field during order placement. We provide standard decoration for our Oblation Table vestments to enhance their appearance. Here too, customers have the option to customize and upgrade their order by selecting premium decoration for an additional cost. Customers can also add velvet inserts to their order if they so desire. We understand the need for a custom Oblation Table vestment and hence provide made-to-measure services. We request customers to provide us with the precise measurement of their Oblation Table. Our experienced tailors in Europe execute each order individually to ensure top class results. We require a few weeks to complete custom orders, so be sure to place your order early!